After flagging off the bi-weekly Humsafar Express from Agartala, Tripura Chief Minister Biplab Deb assured that very soon Rajdhani express would also run bi-weekly from here. 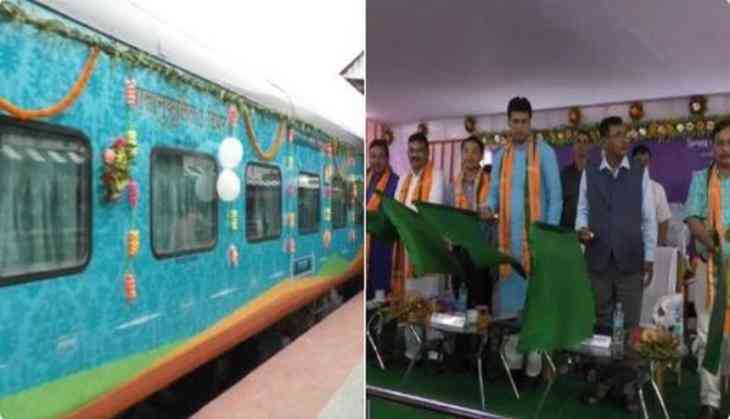 Biplab in the presence of the other Ministers, MLAs and Railway officials flagged off bi-weekly Humsagar Express from Agartala railway station on Tuesday. "Prime Minister Narendra Modi had declared to transform India in transportation sector. Today Northeast is moving in that direction and bi-weekly movement of Hamsafar express proves that. Very soon Rajdhani express shall also start bi-weekly from here," Biplab told media here. He further said work for laying alternate rail track will also begin soon assured as the state will become a business gateway of the region. Humsafar Express, a luxurious train of Indian Railways will connect Bengaluru with Agartala. It will travel 3,542 km distance within 64 hours and its fair a bit more than other long distant trains. In the last four years, Tripura witnessed a lot of development in the connectivity segment, Biplab said adding that the Narendra Modi led-government has sanctioned Rs. 90, 000 crore for railway development in the Northeast region. Meanwhile, Union Minister of State for Railways Rajen Gohain was also present at the event.